Pasta sauce, soup, chutney, stuffed, roasted, raw... tomato is one of the most versatile ingredients for chefs and a key flavour in many, many recipes. 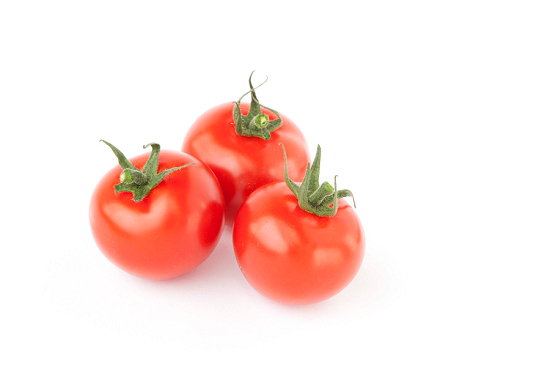 Varying in size, colour and shape, from small cherry tomatoes, to oval-shaped plum tomatoes, to big slicing or beef tomatoes, these fruit gems are a must on all menus. 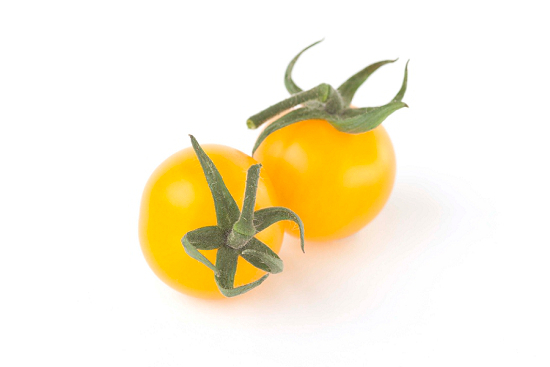 In this Product Profile we have handpicked a diverse range of tomatoes provided by New Covent Garden Market distributor Allison Risebro and grown by Nutbourne Nursery in West Sussex. "Although Allison Risebro has sourced British produce throughout its 35 years of trading, what we are seeing is much greater passion and drive for British ingredients in today's market. 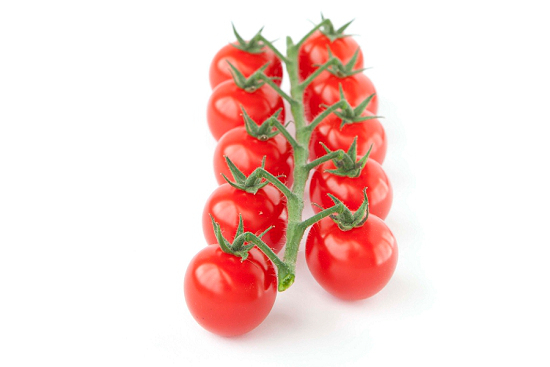 Nutbourne's tomatoes are a fine example of the quality of heritage varieties that British growers are now producing. Located just 53 miles from New Covent Garden Market the nursery in Pulborough has been growing tomatoes since 1979 ensuring the freshest supply to Chefs in the South of England." Here we guide you through a selection of tomatoes. Properties: Small, round bright red tomatoes. Aromatic and super sweet flavour. Useage: Wonderful flavour means they are great on their own or as a garnish. Can be lightly roasted with garlic and sea salt to bring out the flavour. Notes: Leave these out of the fridge to ripen fully on the vine. Properties: Cocoa Cherry are small sweet and chocolate in colour whilst Cocoa Beef are a large and firm chocolate colour tomato, sweeter than red beef. Useage: Their great visual impact makes them great in salads and as a garnish. The seeds are exceptionally tasty. Notes: The beef flavour falls away quite quickly and the Cocoa Cherry can be a bit fibrous due to its thick skin, but still sweet in taste. Less sharp than the cherry vine (piccolo). Properties: Largish in size, sweet and juicy when fully ripe. Orange in colour as the name suggests. Mild fruity flavour and are less tough than some of the other varieties. Usage: Well suited to slicing in sandwiches, and their fleshy texture makes them ideal for cooking. 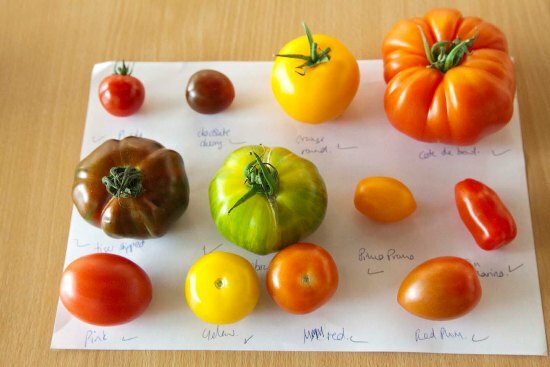 Notes: These are heritage tomatoes and grown with great care and attention, therefore they are all unique. No two boxes are the same making it more exciting for chefs. 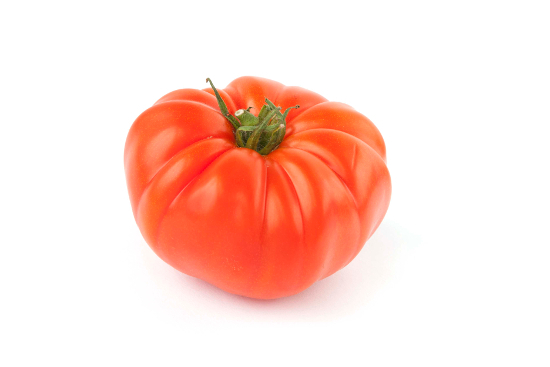 Properties: The Coeur de Boeuf is a ribbed beef tomato of many sizes which is star shaped when sliced horizontally. 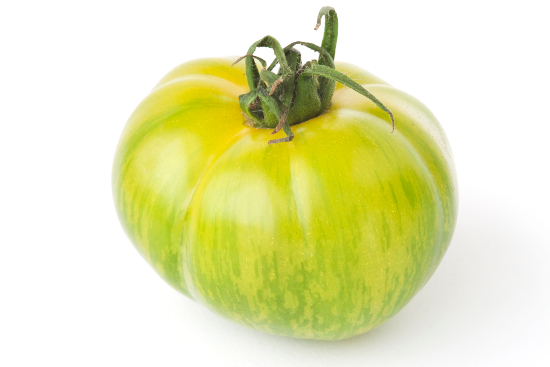 The Marmande is also ribbed but with a flatter shape and comes in many shapes and sizes. Although these look great, they have comparably less taste than some of the other varieties. Usage: Use these in a salad to show their unique shape. Brilliant sliced as a carpaccio. This is a textural, spongy tomato and needs to be dressed for the best result – they soak up all of the flavours. Notes: Due to the lack of flavour these don't work well when roasted. Properties: Green / yellow in colour, deliciously sweet and refreshing. Quite large. Usage: Great for an unusual light Summery soup/ consommé. Notes: Adds an element of surprise to the plate, as you would expect this green tomato to be bitter but it is actually very sweet. 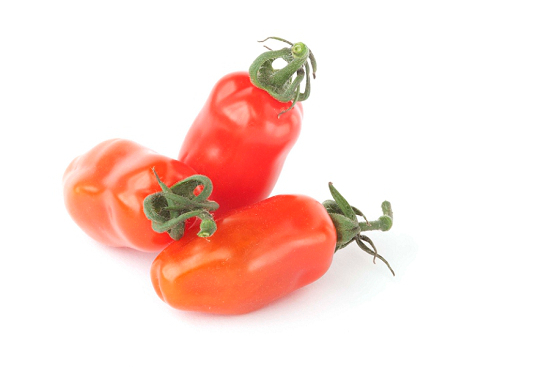 Properties: Mini bright red pepper shaped plum tomato with intense flavour. Thicker flesh with not many seeds, slight bitter-sweet taste. 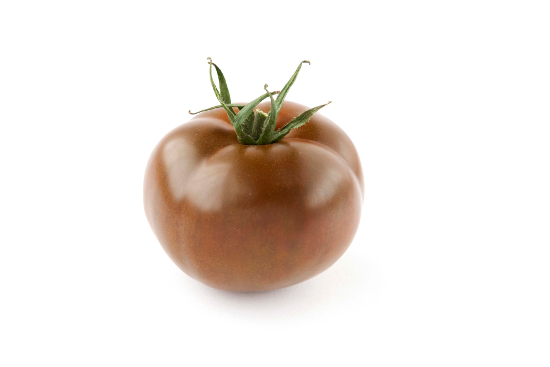 Properties: Very dark small cherry tomato with a thick fibrous skin. Usage: These are not really a salad tomato due to their thick skin. Their sweetness makes them delicious when roasted and served with steak and lamb. Notes: Very high sugar content. 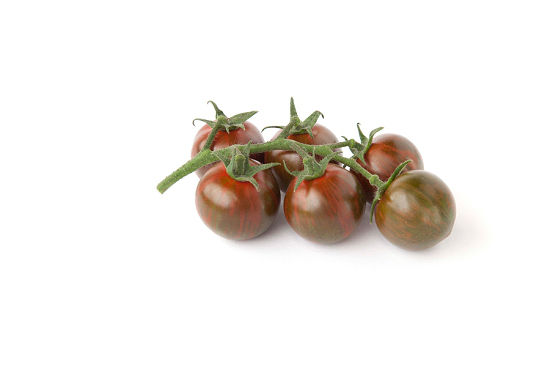 Properties: Pink tinged larger plum tomato with a milder, more melon, flavour than the red plum. Usage: Great in salads, and roasted. Also often used for making sauces. Properties: Small, round and bright yellow variety. 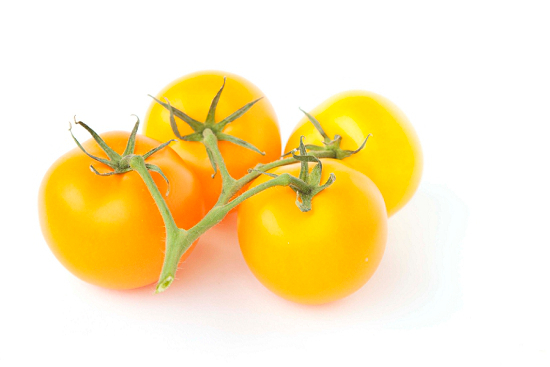 A sweet, succulent variety of tomato that is particularly juicy. Usage: Great for adding colour salads and as a garnish. Roasting brings out the sweet aroma and flavour. Notes: Less acidic than other varieties. 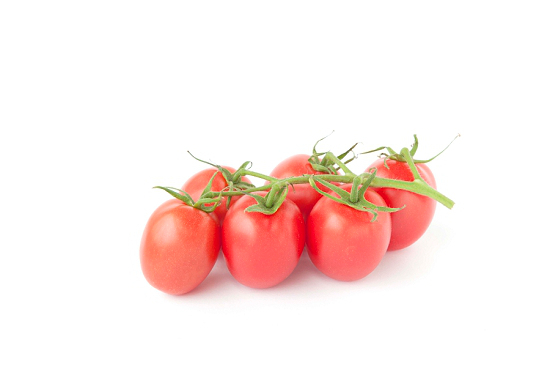 Properties: Classic red small vine tomatoes. Usage: Great cut in salads or roasted in a tart with balsamic vinegar to bring out the intense flavour. Serve with yellow cocktail vine for excellent visual impact. Notes: The most popular tomato tasted amongst the chefs.